QuickLean helps convert all your QTP/UFT/Selenium test artefacts to HP LeanFT – be it in C# or Java. This includes scripts, reusable functions, compiled modules, and object repositories – whether shared or local – all the while maintaining the original framework design and structure. Let’s do a deep dive to see how QuickLean works. QuickLean ensures that three basic criteria of the migration process are perfectly executed – Quickly, Efficiently, and Easily. QuickLean gives you the benefit of choosing the source of the UFT scripts and also the objective repository files. In addition, it also asks you to input the tools and technologies which you are comfortable in using. The Tools and Technologies section helps you select the tools of your choice and the technology you want to use. 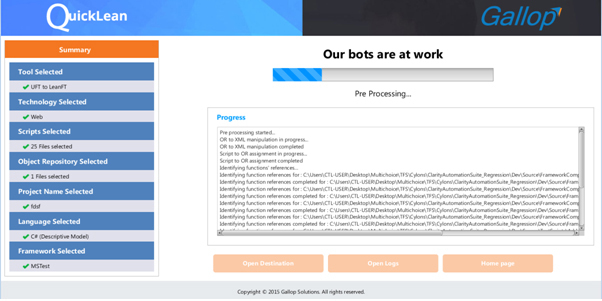 If you would like to migrate from UFT or QTP to LeanFT you could choose the appropriate option and proceed to Technology selection screen where you can choose the appropriate technology/platform that was used to build the Application Under Test (AUT) whose test artefacts are being converted. For example if you used web enabled SAP or NetWeaver application to create the scripts, then the options to select are SAP and Web. The Script Files section, as its name implies, is the location where you can provide the location of the scripts that are to be converted. You could have your scripts located on a file system, or uploaded into HP QC or HP ALM. 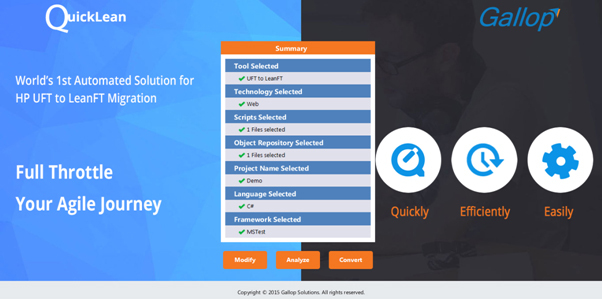 QuickLean can automatically connect to ALM and download scripts and use the downloaded scripts as source files. QuickLean has an Object Repository (OR) Files section, which is the location of the QTP/UFT OR files instead of the test plan folder location. The features of this section ensure that all the OR files (both Shared and Local) that are being used by the scripts and Library Functions are selected for migration. This step often needs expert manual intervention to ensure all the required files are correctly selected. The Target section helps you define the various target details like the language in which the LeanFT scripts are to be converted, the Framework, the location etc. In this screen, the target path needs to be specified, objects’ reference type is input, and a choice between Descriptive Programming and Application Model is made. After making the required selection using the radio buttons provided, click Next to progress to the select the Framework to be used. The Framework section enables you to select the Target Language and the Framework/IDE to be selected. Based on this selection, QuickLean will convert scripts to C# or Java. After providing the Source and Target input data for QuickLean, you can kick-start the conversion. Before you start the conversion, however, it would be good to understand the work parcel that is being converted. Confirm the details of the conversion. The intuitive analysis reports provide insight into the number of scripts, functions, check points, object repositories, and other important information that is being converted or is being used for the conversion, leveraging the best practices of migration with a Cigniti Advantage. Have you leveraged HP LeanFT yet? Try QuickLean today to get started with LeanFT.